"It is with great sadness and incredibly heavy hearts to write that Verne passed away today," a post on his official Facebook page read. "Over the years he's struggled and won... but unfortunately this time was too much," it added. He has also made regular appearances on Celebrity Juice and starred in Keith Lemon's feature length film, Keith Lemon: The Film. 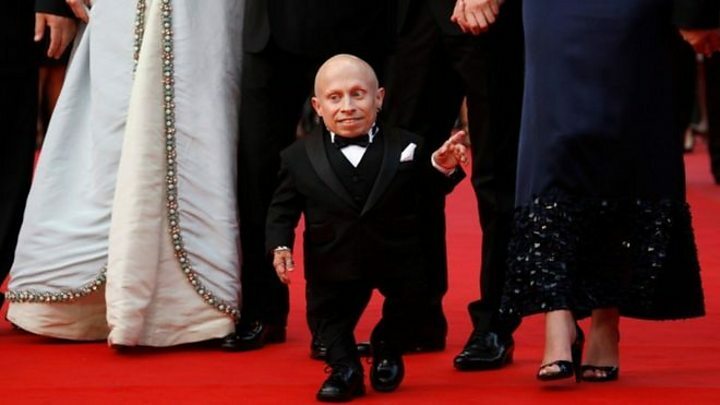 Another performer of restricted growth, British actor Warwick Davis, also paid tribute to his friend. One of Troyer's first roles was as a stunt double for a nine-month-old baby in the 1994 film Baby's Day Out. He appeared in two Austin Powers films as Mini-Me, the clone and sidekick of Dr Evil, played by Mike Myers. "Verne was the consummate professional and a beacon of positivity for those of us who had the honour of working with him," Myers said in a statement given to The Hollywood Reporter. "While it's not always been an easy fight, I'm willing to continue my fight day by day," he said. In 2012, Troyer made a donation to a disabled children's charity in Northern Ireland after it was targeted by thieves. "Please tell them hello from me. Also, remember you can do anything you set your mind to, always be optimistic."